Redesigning your kitchen is not only an opportunity to make the space a more pleasant area for yourself, it’s also the perfect opportunity to choose furnishings and decorations that are healthy for the environment. Kitchens are the one place where any update you do will increase your home value. People use their kitchens so often that it is worth it to have reliable appliances, attractive furnishings, and functional storage spaces. One of the modern trends that can positively benefit your health and give your kitchen a fresh look is green, eco-friendly cabinets. In the 1990s, the “green trend” became a major look. People began to wear recycled accessories and clothing. Many aspects of home decoration have also been updated to have less impact on the environment, from manufacture to the way that they age over time. We supply these as the newest trend in home design and they give any space a modern, chic look. When you’re looking into buying new cabinet doors, you might not realize that a large number of those on the market are constructed with formaldehyde glues. Formaldehyde is a known carcinogen, but small amounts haven’t been banned by the government. Green cabinets, however, take no chances. We use renewable materials, which are not constructed with the use of carcinogenic binders. 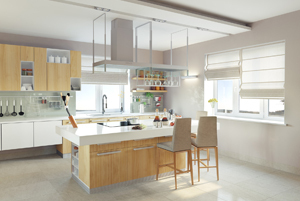 Some cabinets are also finished with materials that can be harmful to indoor air quality. Volatile organic compounds are often released as kitchen cabinets and other wood furnishings age. Water-based finishes won’t release VOCs. The type of wood you use will also determine how sustainable your cabinet choices are. Bamboo plywood and agrifiber boards are able to be harvested sustainable and won’t destroy valuable habitats of animals and very complex ecosystems. When you decide on green cabinets, you can rest knowing that your cabinets aren’t harming your own health or that of the planet. Even when you’re being responsible, you can still be stylish. Green cabinets come in a range of styles and finishes. Because being environmentally friendly is so desirable at this point in time, cabinet manufacturers face a huge demand for new looks and up-to-date types of cabinets. You can choose from sleek, dark woods or lighter woods. You can personalize your cabinets and other furnishings in your kitchen by choosing the types of handles and hinges that will work for your needs. Depending on the color and tone of the wood you choose, you can pick warmer or cooler metals. Steel, silver, and iron pieces are cool and work well with darker wood. Lighter, warmer woods like bamboo look great with gold or brushed steel metal components. With all of the choices available, choosing to get kitchen cabinets that are environmentally-friendly is not a sacrifice, but something that will actively add to the usability and beauty of your home. We can help you learn more about all of these options and can give you detailed information about customization options. Designing a kitchen should be a fun experience that you can enjoy and find to enhance your home’s value. © 2019, Pittman Discount Building Supply. All Rights Reserved.